Home > A great way to do Airdrop efficiently by developers, may be this is for the first time in the world! A great way to do Airdrop efficiently by developers, may be this is for the first time in the world! Hello! This is Tebura Ninja Team! I post it without any editing, although it is charming the video starts with the the introduction of Kamikami from the the beginning, sorry for being that but i would be glad if you can see all of that. This time I am sharing very useful information for developers who are familiar with cryptocurrency and ICO! you would be grateful by watching this. 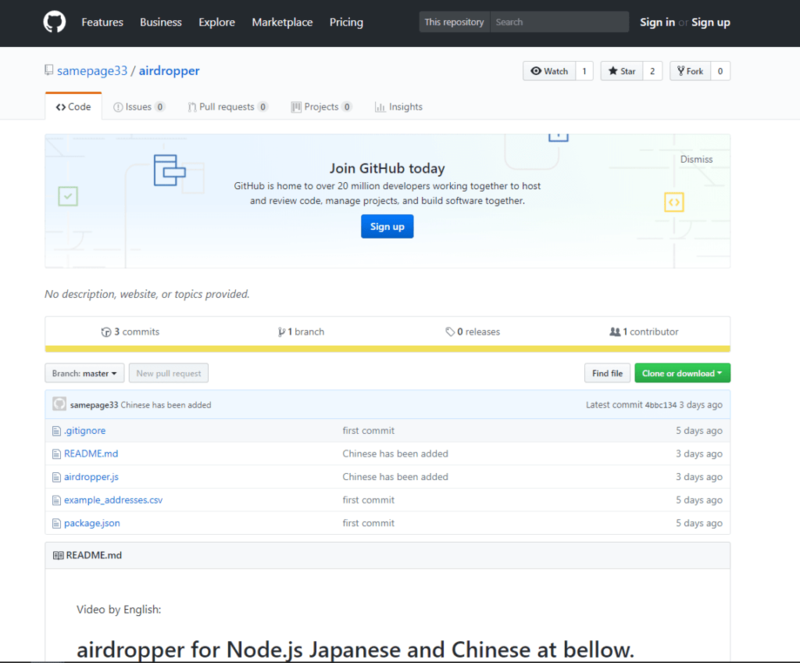 Tebura developer Yasu made a program called “Airdropper” based on node.js! You can use node.js to send a fixed number of ERC20 compatible token automatically to the addresses that came to the CSV file list. At the beginning i have tried several times, if anyone sent multiple request without loading this Airdroper at a time the network gave error signal. But using the Airdropper you can solve the problem and can do airdrop more efficiently!! 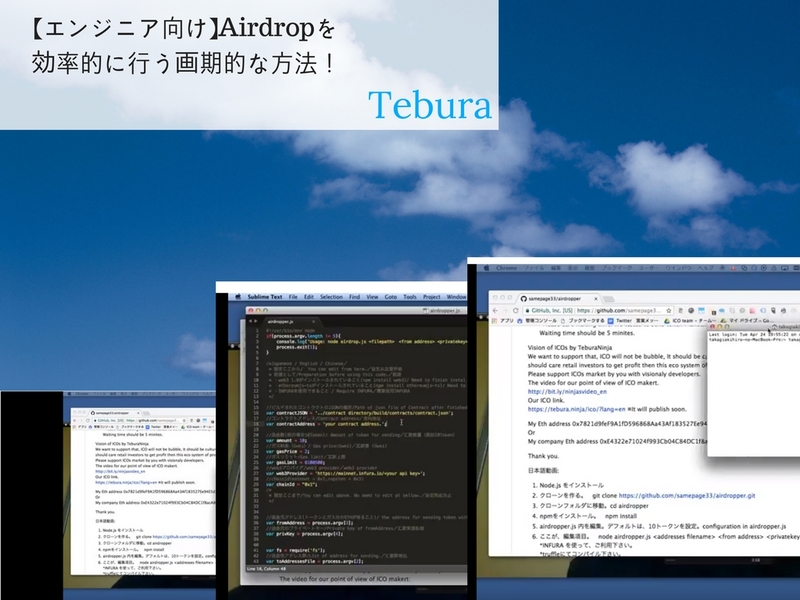 Tebura during the time of airdrop used Airdropper to distribute tokens. Tebura will open this as an open source program. You can join and try it! Feel free to contact with us for any types of query! We are trying to establish ICO as a new culture in Japan through decentralized funding method not to go with the culture of bubble in this market. From that point of view we believe that it is very important to provide information to the ICO supporters and investors to form an ecosystem where everyone can join on continuous basis. If any developers believe with our vision then they can join with us to help us. Ninja token will be paid as reward for the contribution. We can call him “Ninja” Programmer. We are waiting for a new “Ninja” who can value our thoughts. Do not hesitate to contact with us if you have any query. You can contact with us through Twitter and Website. Tebura’s Telegram page is recommended to contact with us and also to get fast response from us. Previous Previous post: River spots in Tokyo!